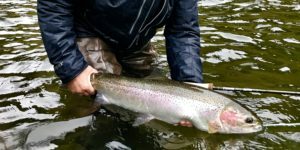 STEELHEAD OUTFITTERS PROVIDES GUIDED FLY FISHING TRIPS FOR SUMMER STEELHEAD ON WASHINGTON’S KLICKITAT RIVER. The Klickitat River meets the Columbia just west of Lyle, WA. Descending nearly a hundred miles and 6,000 feet from Mt. Adams the river picks up speed and volume from the many creeks and tributaries draining the east cascade range. When freezing levels are above 9,000 feet the river has a very glacial hue, and water clarity suffers. 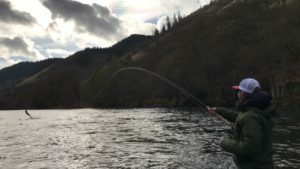 Home to Summer Steelhead, Spring and Fall Chinook, and Coho Salmon the Klickitat is a very popular fishery and anglers travel from abroad to fish there. Fishing opens June 1st and is closed after the last day in November. In 1986 the lower ten miles of the river was designated Wild and Scenic. 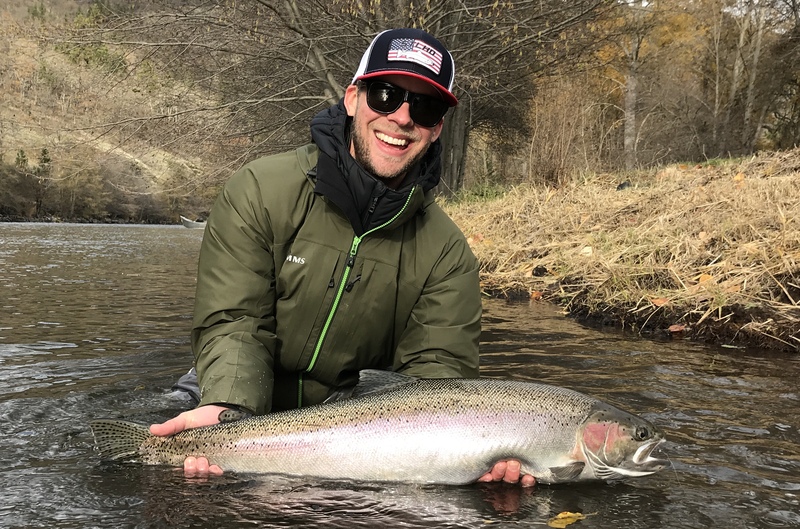 Steelhead Outfitters has been granted a United States Forest Service Permit for 2019 on the Klickitat which allows us to fish the Columbia River Gorge National Scenic Area (river mile 10.8 to RM 0) – this section is home to the best swing water on the river with broad runs, drops and pools as opposed the upper rivers more pocket water characteristics. Fishing from a boat is allowed on the Klickitat and is the most popular way to fish it. We navigate the river in a Koffler drift boat or a 16 foot Aire Cataraft. We provide a spey rod swing fishing experience, it’s in our DNA but we will fish from the boat between the runs. Guided Klickitat River trips include fly rods, spey rods, flies, lunch and beverages. Waders are available if needed for a rental fee. Good accommodations are available in nearby Hood River, White Salmon or The Dalles. Not included is a WA fishing license with Columbia River Endorsement, WA sales tax, USFS fee, gratuity.